Vernia Hawthorne, Barbara Jackson, and Jewel Minor are utility operators with the City of Richmond Department of Public Utilities. 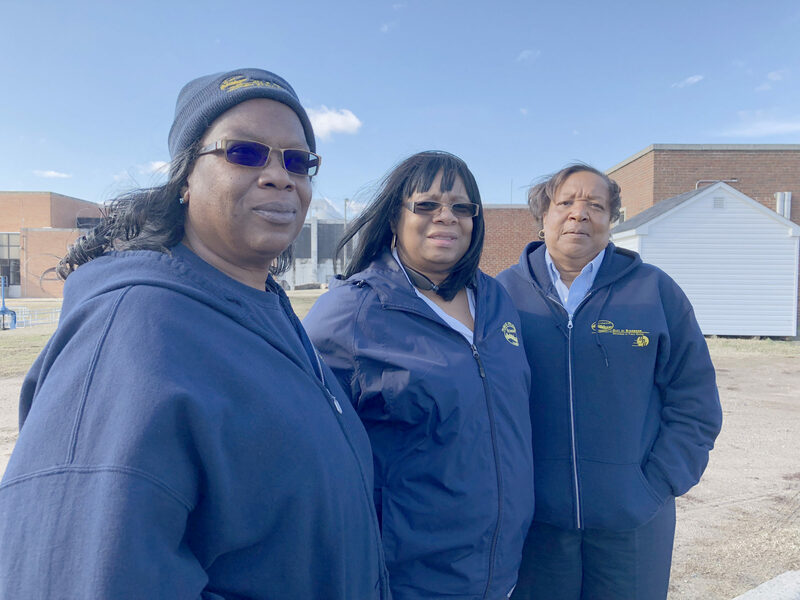 Getting the job of utility operator might have seemed like the easy part for Vernia Hawthorne, Barbara Jackson, and Jewel Minor, but actually doing the job – and for so many years – has been more of a challenge. No other women who have been hired as utility operators at the City of Richmond Department of Public Utilities have lasted as long as this trio at the retention basin. In fact, Hawthorn, Jackson, and Minor are the only women in the position. Vernia Hawthorne has been with the city almost twenty-eight years. While working for an insurance company, she saw an ad for entry-level utility operators. As a single mother, she was looking for better pay, and the work sounded familiar to her. “My father had worked here as a custodian, so I knew something about it,” she recalled. She was immediately hired along with another woman. The job, at the time, required a third-grade education, she said, so experience in the field was not a requirement. The other woman hired with Hawthorne did not stay. For women seeking a good job in the 1970s, it was an opportunity. Jackson has been with the city forty-one years. She started as a temporary employee with the Department of Public Works, driving the leaf collection trucks. Her supervisor recommended she apply for a utility operator position. She was pregnant and said she wanted something for a short period of time. That short period turned into a long-time job, but it was far from perfect. “Conditions were terrible. They didn’t know how to deal with female employees – or pregnant ones. There was no support. We just had to deal with it,” Jackson said. Jackson did notice, though, that although it was okay for her to be on the same shift when her husband was supervising, when she became a supervisor, her husband, who has since retired, was never assigned to one of her shifts. All the women agree they feel the difference when new contractors or vendors come to meetings and immediately gravitate to the man in the room. “And they try to pull things over on us, like sell us new equipment or parts instead of fixing things,” said Jackson. Minor has been with the city thirty-nine years. She was still in school when she applied to be a water lab technician at the wastewater plant, and she stayed in the lab for twelve years, but there were few avenues for advancement there. Utility operations offered more money and it was more challenging, so despite the shift work, she applied and was hired. What the women have seen and learned at work carries over to how they manage their households and operate in their communities. “ It makes you think about things, even at home, like not pouring grease down the drain,” said Hawthorne. Through the DPU, the women participated in the Lunch Buddies program, spending time with children at a nearby elementary school, and found what they learned on the job gave them new ways to explain to children the importance of protecting the environment. They all recommend their jobs to other women, even though it’s a seldom-publicized career track. “I get a whole lot of looks when I talk about it as a career. People just think it’s a smelly place,” said Jackson. There are currently no other women working as utility operators. The ones who have been hired over the years have left, or didn’t complete the necessary licensing, which requires independent study and online coursework. The women agreed that the swing shift hours are a deterrent for many. Also, good jobs for females and minorities are not as difficult to find today as they were three or four decades ago.